Electrically conductive primer coating for shielding of high-frequency radiation (HF) and low-frequency electric field (LF). Pure silicate paint based on potassium silicate. 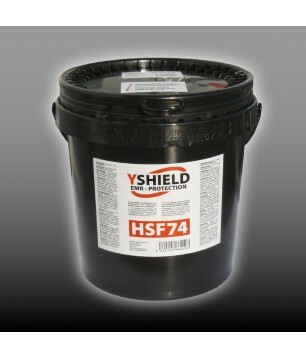 Highly breathable, very low VOC content, free of solvents, without in-can preservation! Developed with a bare of ingredients for maximum ecology! Application only by a professional painter with protective equipment due to the ph-value of 12 (superalkaline). 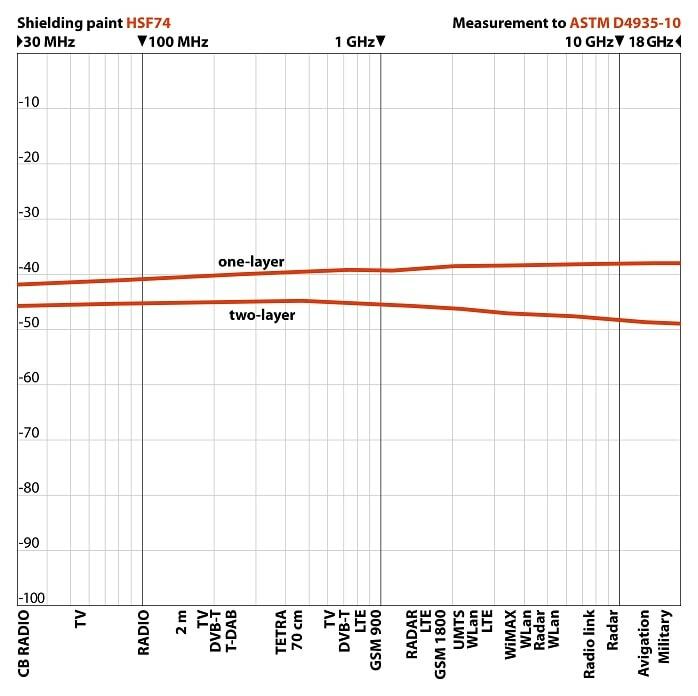 Shielding attenuation: Attenuation of 37 dB (shielding effectiveness of 99.98 %) in one layer, attenuation of 45 dB (shielding effectiveness of 99.997%) with two layers. The shielding attenuation is regularly tested in our own laboratory or by Professor Dipl.Ing. Pauli at the University of the German Federal Armed Forces in Munich due to the standards ASTM D4935-10 and/or IEEE-STD-299-2006. Perfect corrosion resistance: Most shielding products containing metal components are not adequately protected against corrosion. 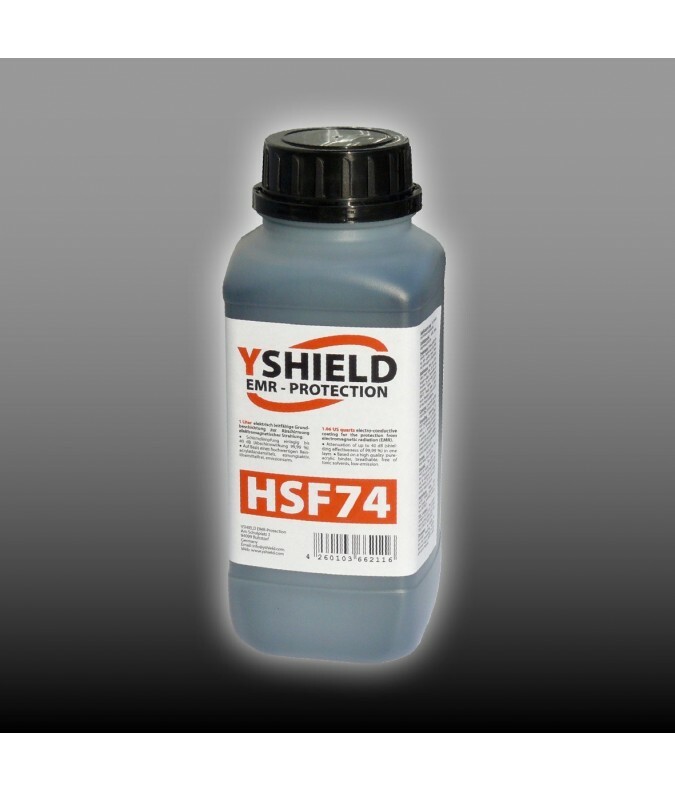 Our shielding paints HSF54, HSF74 and NSF34 shield without metal particles using a mixture of carbons. Therefore they offer perfect corrosion resistance (no oxidizing) and long-term durability. Underground: Interior and exterior: Good adhesion on absorbent, untreated, preferably mineralic undergrounds like chalk, silicate, clay, etc. Restricted use on absorbent emulsion paints, wallpapers, etc., please check first! Not usable on gypsum based substrates! Top coating: Can be covered with water-based, plastic bonded emulsion paints. Due to ecological reasons, KEIM dispersion silicate paints (Biosil, Ecosil, Optil) as well as AURO high-grade lime paint (no.344) and silicate paint (no.303) are highly recommended. Many natural resin paints and paints made of clay or lime putty are not recommended! Grounding: Must be grounded, please find more information on our „grounding accessories“ pages! To bridge cracks in the underground, this paint is reinforced with conductive fibers. Nevertheless, we recommend our grounding strap EB2 at the interior in combination with our grounding set ESW or ESW+. Frost resistance: Not frost resistant, shipping only on temperatures over 0°C or with UPS Express. Ingredients: Potassium silicate, water, graphite, carbon black, additives. VOC content: 0.0 g/l (EU limit value is 30 g/l as of 2010). • Sd-value: ~ 0.01 m. • Ph-value: 12. • Delivery sizes: 1 and 5 liter. • Shelf live: 12 months. • Typical coverage: Interior 7.5 m²/l; Exterior 5 m²/l. • Colour: Black. • Adhesive pull strength: 2.5 N/mm².